The Denmark Flag is the oldest flag in the world that is still used today. It was adopted on June 15th, 1219 and features a red field with a large white cross that meets all the edges of the flag. The vertical line of the cross is positioned slightly to the left of center. The red color on the flag represents the battles fought and the lives lost, while the white cross represents Christianity which was the purpose of the battle. 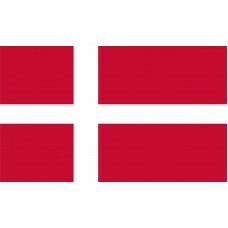 The cross on this flag has also been adopted by other Nordic countries including Norway, Sweden, Finland, and Iceland. 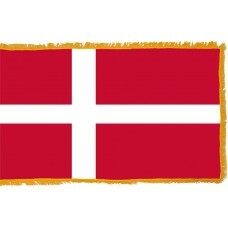 The people of denmark take great pride in the fact theat their flag is the oldest in the world. In fact, according to Danish legend, during the battle of Valdemar with Estonia, Denmark was losing badly and just as they were about to surrender and began to pray, the flag fell from the sky. It is thought that this flag gave the men the hope and inspiration that they needed to continue in the battle and to ultimately become victorious in the battle. The Denmark Flag is often referred to as the "Dannebrog" or "Danish Cloth" and every year on June 15th, the flag is raised in tribute to all the soldiers who lost their lives during the battle of Valdemar. Denmark is a Scandinavian nation located in Northern Europe and is the smallest of the Scandinavian countries, sharing its borders with Norway, Germany, and Sweden. There is a bridge that connects Denmark to Sweden. Denmark has over 443 islands, 70 of which are inhabited. The three largest islands are, Zealand, Funen, and the North Jutlandic Island. The largest city and capital of Denmark is Copenhagen, which is located on the island of Zealand. Copenhagen is the most visited city in Europe, attracting thousands of tourists each year. The two main attractions that one can visit in Copenhagen are the Tivoli Gardens and the Stroget. The Tivoli Gardens opened in 1843 and are home to the second oldest amusement park. As well as the amusement park, there are many historical buildings and gardens which are popular attractions for visitors. Stroget is the longest shopping street in Europe and is located in the old city of Copenhagen. Another very famous attraction is a bronze sculpture named, "The Little Mermaid." The statues, which is located at Langelinje Pier and was 100 years old in 2013 was inspired by Hans Christian Andersen's story about a mermaid who swims to the surface every morning and evening to sit on her rock. Hail king and native country!